I am leading a seminar at our regional leader retreat next weekend about how to share Christ. I did a similar seminar last year and I got good feedback. This year I want to focus on investigating what God has already done in their lives. In other words, this person may have never heard of God, or they might be ready to come to know Christ the day you meet them because of other ways God has worked in their life, or they may know Christ and need to be challenged to grow. So the seminar theme might be, "investigating and doing your part" of God’s plan in their life. This might not be "leading them to Christ", though it might be. This could have a couple benefits, one would be that we don’t just assume that everyone is brand new to the gospel, in fact that is not even biblical. Furthermore statistics tell us most kids have been involved in Christian churches in one way or another. More than that, we will have to be more skilled in our friendship to examine what is needed. It is easier to start at square one then to know them enough to move on. 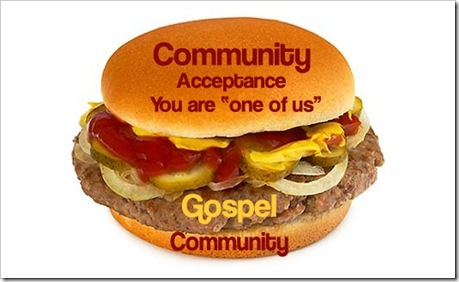 One other thing I want to include is the idea of a "community sandwich". This is the idea that they are "in" our group, they are accepted, loved, one-of-us, and in the midst of that, we also talk about Christ. 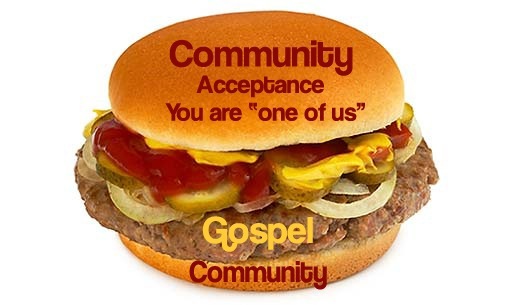 We accept them and love them before, during and after any interaction about the gospel. Not a new idea to us, but certainly one that seems to be new for those who think it is a postmodern or emergent approach. What are some of the most helpful concepts you have learned about sharing Christ? Does the hamburger above make you hungry? It makes me want In-N-Out right now. Fantastic points about engaging students/people right where they are. Have you heard about the Young Life + Blood:Water Mission project called The Fall Campaign? This could also be a fantastic way to engage in a project as a group; love them before, during, and after any discussion of the gospel…and make a difference. Thoughts? By the way, Pat Goodman is the speaker in this video. He is a long time Young Life supporter here in Maryland!